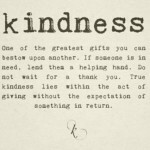 KINDNESS is a fruit of the spirit ( Galatians 5:22 ) and is a powerful door opener in speaking to others about the love of God. Together as we show His kindness, we can meet the goals He has for us. Previous PostPrevious Well Done, Good and Faithful!